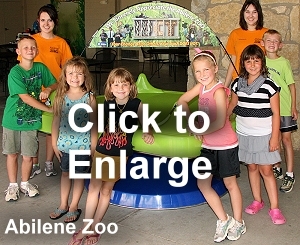 We are excited to present our giant Seven-Footer Well (2.1 meters, measured diagonally). 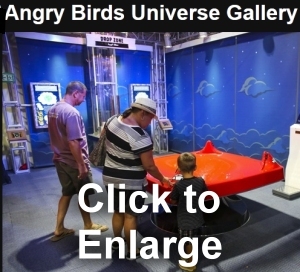 It is more than four times the surface size of the Three-Footer and features eight molded-in coin launch ramps. Because it is visually compelling and 8 people can play at a time, it attracts more attention and the income is DRAMATICALLY greater than our original large 5-footer Wells. Even if you already have a large coin funnel that has been paid-off long ago, a new Seven-Footer will pay for itself AND raise MORE money in the first year than your old funnel! The increased income over the years is exponentially greater! More coin rolling surface = more spirals = longer show = more money! 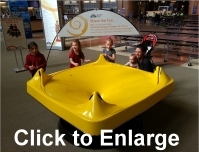 Size: With an outside diagonal dimension of over seven feet, the live coin-rolling surface is a full and open five feet two inches (62 inches, 157.5 cm). 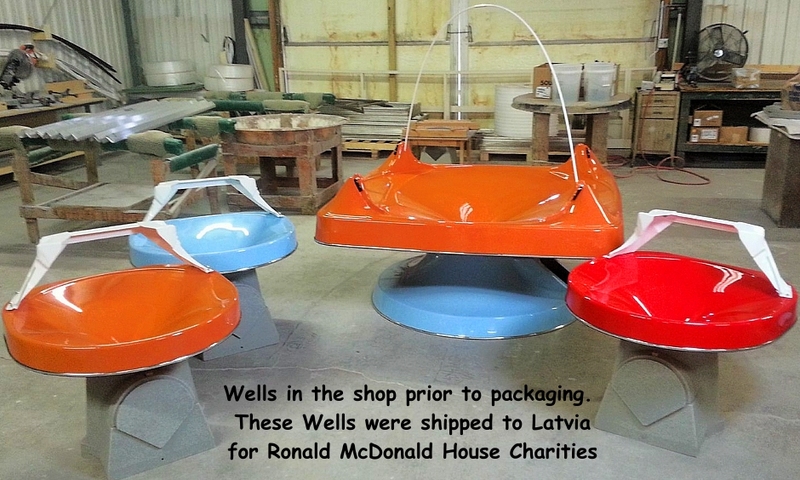 Our previous large Wells were five feet (60-inches, 152.4cm) in diameter to the OUTSIDE of the entire Well. 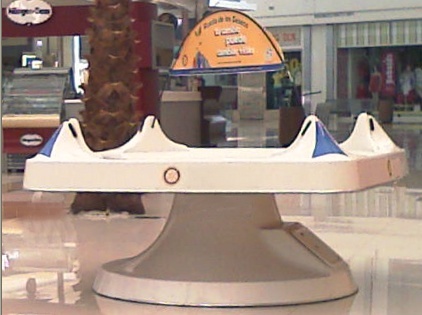 The coin-rolling surface was closer to 4 feet (48 inches, 122cm) and the launch ramps were mounted on that surface. Therefore, the coins were launched on a path so they would miss the ramp on the other side, effectively making the actual first spiral closer to 3 feet. Our new patented coin-launching geometry with the ramps OUTSIDE the surface uses the ENTIRE funnel surface for the coin-spinning show. 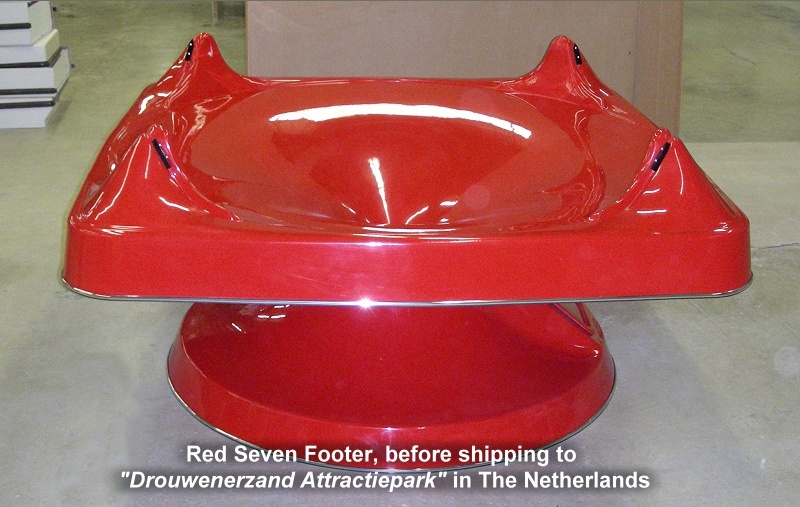 Shipping: Seven-Footers are shipped by truck freight, or internationally through consolidated air freight unless you are ordering multiple quantities that can benefit from sea-freight containers. We have shipped Seven-Footers all over the world...including China, Latvia, Norway, Costa Rica, Russia and many other countries. 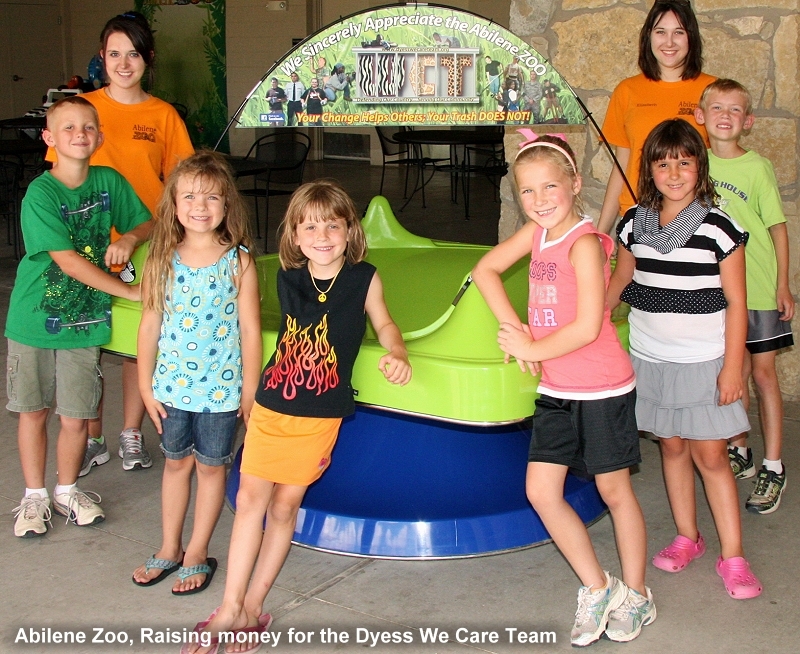 The wide "Coin-Drop" slot makes it easy for young children to launch coins. Some museums roll ball-bearings or marbles which are launched just below the coin-drop area (they don't need as much ramp-speed) for exciting physics and orbit demonstrations. If you are ONLY going to use it for balls, then you can order it without the coin-guide at the top. The "TEST YOUR SKILL" oval encourages experimentation. Click here to see a readable close-up of the sticker. Note: The best size ball bearings or marbles are 1/2 to 5/8 inch diameter (1.27 to 1.59 cm). Ball bearings are a lot better because they are perfectly round and smooth. Marbles are neither. Also, they have a greater mass which also produces more spirals and a longer show. BB's are also fun to launch. You can pour an entire carton of 1,000 bb's onto the surface and watch them create mosaic patterns as they bump into each other and change shapes. 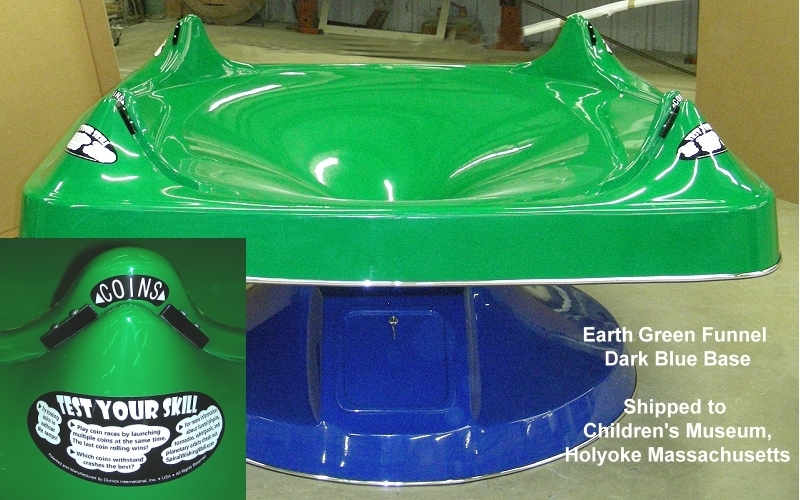 This unique patented design places the coin ramps "outside" the funnel on extended mounting surfaces molded into the fiberglass. 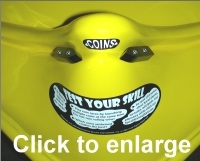 The result is longer and larger coin rotations using the full 62-inch diameter coin-rolling surface, yet it doesn't take up any larger foot-print than a five-footer when approached from the front. Simply stated, it is the largest production coin funnel in the world and maintains our position as the innovator and patent-holder of these unique coin devices. 8 Coin Launch Ramps: It features four coin launch stations, each with two ramps (8 total) that are molded as part of the funnel rather than made of different materials and mounted separately. So the durability is exceptional. Each ramp has two chutes that launch coins in opposite directions, so a total of eight coins can be launched at a time! Imagine the fun with being able to have eight people launch coins simultaneously! This will provide a lot of fun, excitement, and educational experimentation. The play-value is extraordinary as people will be able to race each other and play "destruction-derby" -- the last coin standing wins. When 8 coins are launched at the same time, there are lots of near misses and collisions. Fortunately, for the benefit of coin-revenue, quarters withstand crashes the best!!! 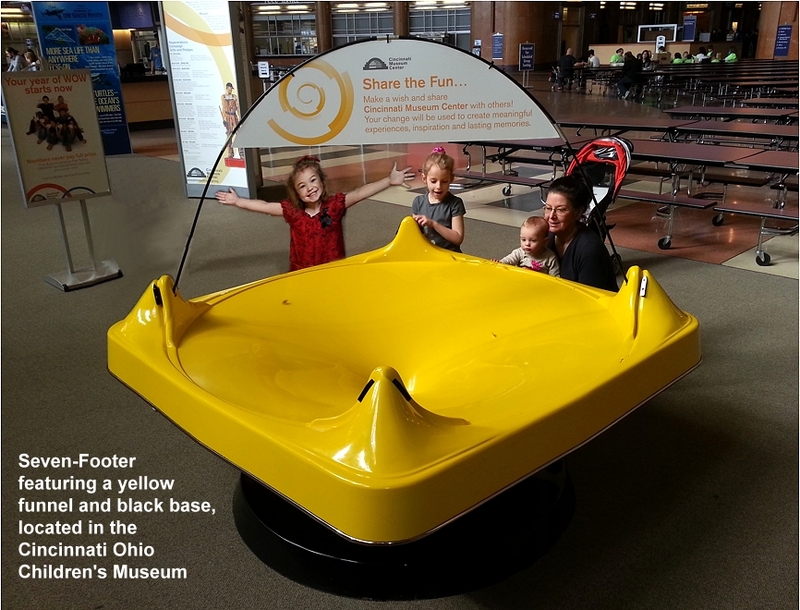 Attention Museums and Educational Installations: With the uniquely designed "V-slot" ramps, the Seven-Footers are designed to also launch marbles and ball bearings! Since the ramps are mounted outside the funnel, the Seven-Footer has an unobstructed rim all the way around that "holds" ball bearings and marbles for scientific experimentation and orbit observations. You can drop a marble or ball bearing down the ramps, or spin the ball around the rim similarly to a roulette wheel. With a little bit of momentum, the ball bearing or marble spins around the rim several times before it begins to spiral down the surface of the funnel. 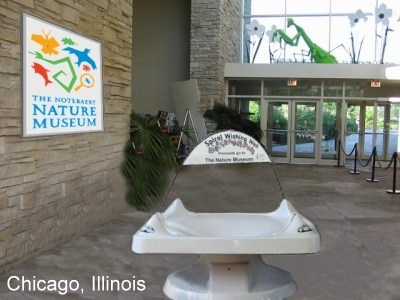 This is great for educational installations such as hands-on learning museums. Dropping balls in various orbits illustrates the varying orbit paths of the planets and the "black hole". And if you haven't ever seen it, one of the most amazing demonstrations is with a few thousand bb's dumped out onto the funnel surface. Since they do not fall over, they constantly bump into each other and form a "movie" of changing formations as they interact with each other on the spiraling journey. 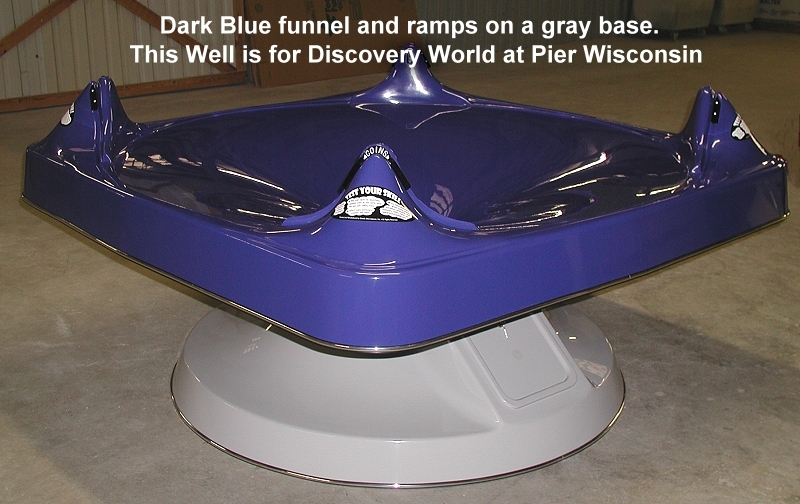 It has a rim-height of 27" (69cm) so that children can see the coins all the way down the vortex funnel. 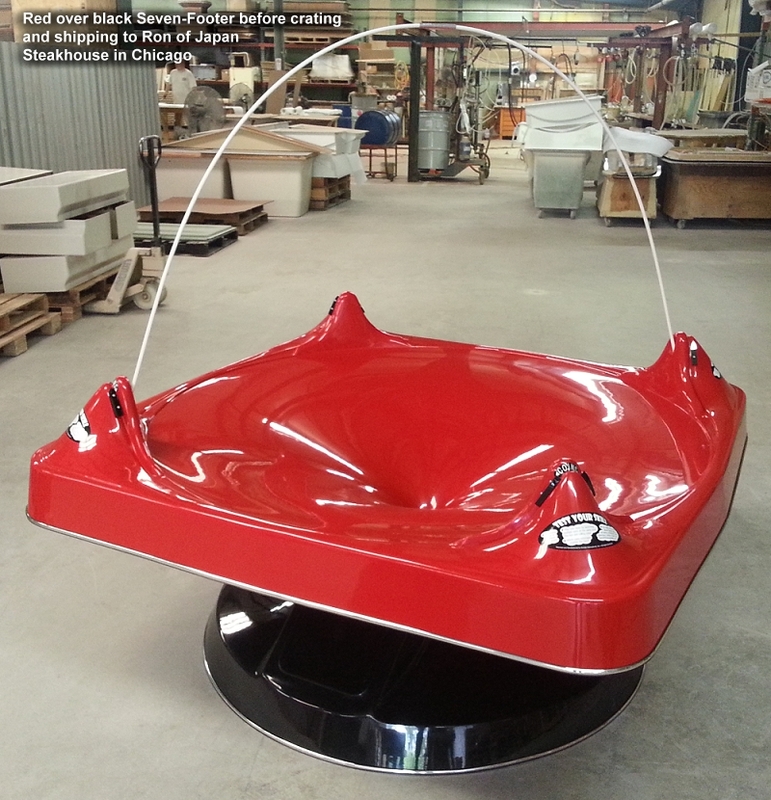 The Seven-Footer includes a fiberglass base, factory welded to the funnel, forming a rock-solid foundation and a stunning visual image. It has a locking door on the side of the base with a completely sealed floor and secure coin receptacle space. Collecting the coins is as simple as unlocking the door, and removing a bucket or container of your choice. We offer a slide-in steel box as shown in the pricing section below. It is easy to slide out the door, especially when heavy with coins. 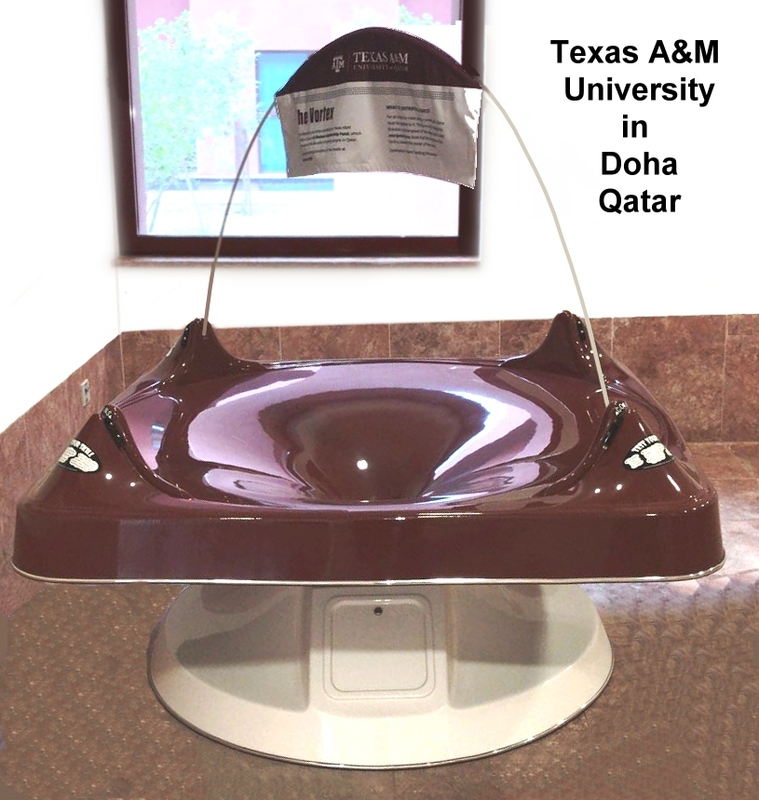 Both the funnel and the base are made of automotive-quality fiberglass. 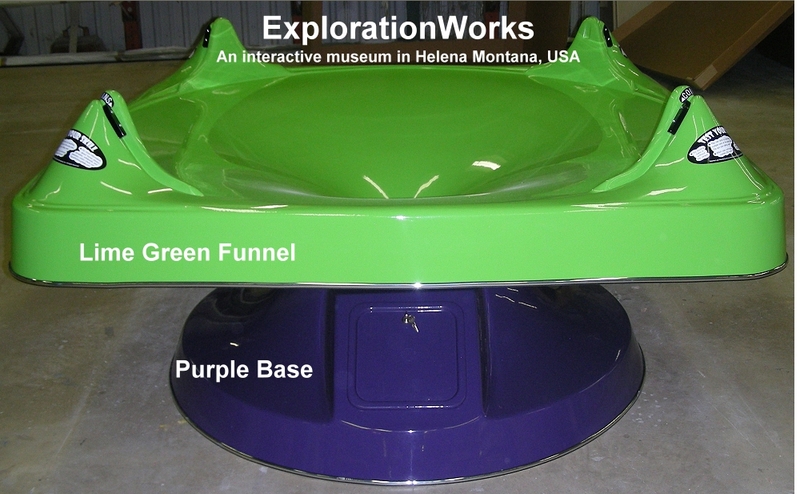 The coin launch ramps are molded as part of the funnel. Nothing is more rugged than that. Other models use separate bolted-on ramps that are vulnerable to abuse and breakage. Upgrade: If you have one of the older Five-foot models, we would love to provide an upgrade to the new Seven-Footer so you can raise a lot more money in that floor space. Please contact us and ask about upgrade options. 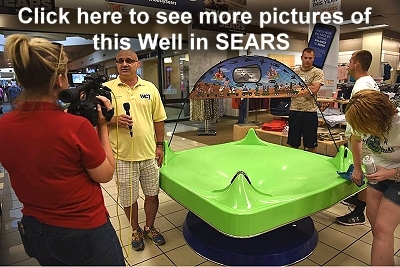 This placement in a SEARS store in a shopping mall in Abilene Texas uses some great strategies for increasing income, attracting sponsors, and getting great media publicity. Click here or on the picture to see more images and read about how they have gotten the most out of their Well for many years. All of the above features make our new Seven-Footers much more profitable than our earlier models, or any copies that have been made since. 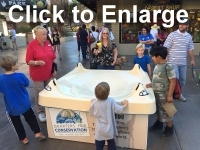 In fact, we offer a guarantee to the hundreds of museums and zoos around the world who have the old 5-foot models: Even though your existing 5-footer is already paid for, you will raise more money in the first year with a new Seven-Footer, over and above its cost! Therefore, if you are thinking of getting a large Well for the first time, even if you could get one of the old models free, it wouldn't raise as much money as the new Seven-Footer in the first year...including paying for itself! And of course, nothing compares to the durability of molded-in launch ramps and the professional automotive-quality of our Wells. So it is an investment you can be proud of, and confident that it will generate the most money possible for your fund raising needs. Unlike the Three-Footers, we do not inventory Seven-Footers because of the many color combination options. They are built when the order is placed, and the lead-time is usually about 2 weeks, depending on current demand. Please contact us for current lead time. There are 3 or 4 natural themes that the ramps look like: 1) The Space Shuttle…They look like 4 space shuttles on the launch pad...which will be great for all the air and space museums. 2) A dolphin or porpoise coming out of the water …great for aquariums. Place a couple eye-ball stickers on the ramps and your visitor's imagination can do the rest. 3) Roller Coasters…great for theme parks.4) Moonscape and other celestial bodies which will naturally fit the theme of planetariums. Of course, the play value and the educational value (the physics of gravity and inertia) will make the Giant Seven Footer Spiral Wishing Well a popular attraction in any environment. Feel free to use any of the information and illustrations in our Student Guide. This Seven-Footer was sponsored by a lady in Colorado, in memory of her husband, for a Rotary Club in Mexico. It is located in a new shopping mall that only has half -occupancy so far. Still, they reported $30,000 pesos during the first 4 months! That is fantastic, especially in this tough tourist economy. 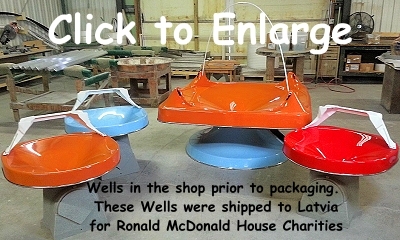 Personal and family sponsorships are a very popular way to fund Wells. Click here to read more about how to find a sponsor. Most Seven-Footers are placed in large floor space locations like shopping malls, museums, zoos, airports, or stadiums such as the Arizona Diamondback baseball stadium. 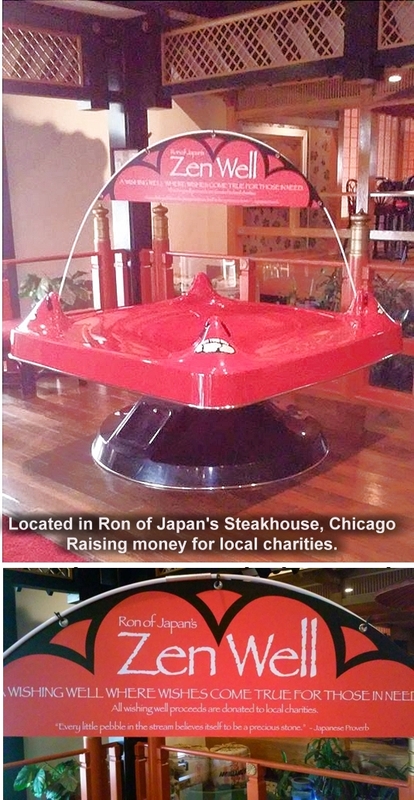 But some are also placed in relatively smaller venues such as the one pictured to the right at Ron of Japan's Steakhouse in Chicago. It raises money for local charities and gives people something to do while they are waiting to be seated. 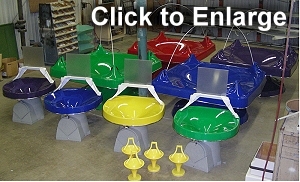 Click here to see the many color choices. 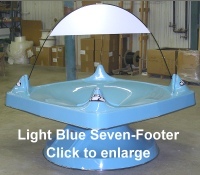 The Seven-Footer is all fiberglass, including the ramps and base, so you can choose two different colors if you wish. 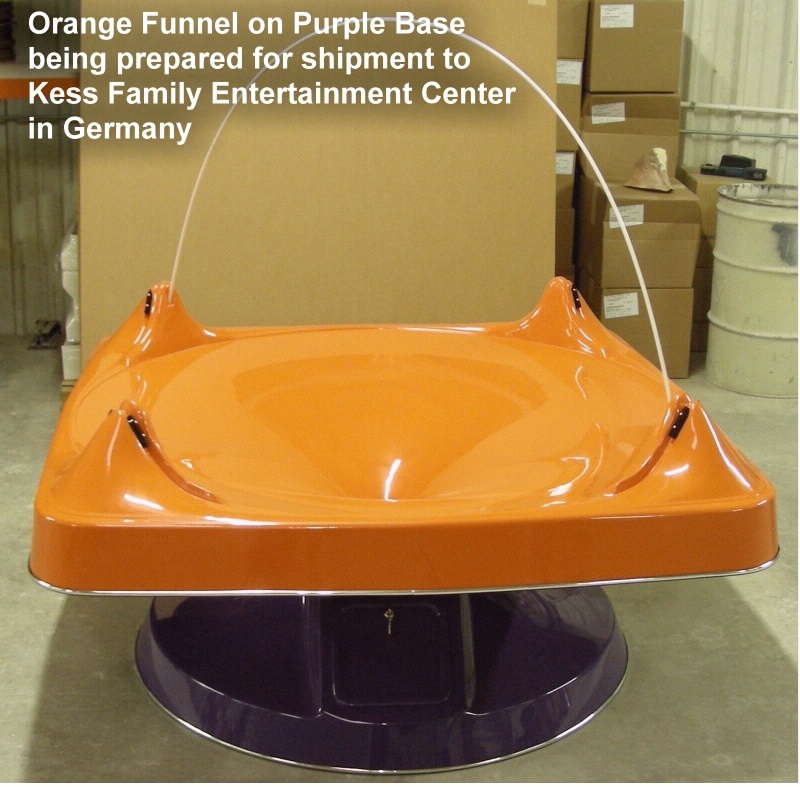 In other words, the funnel portion can be one color and the base/pedestal can be another, as illustrated in many of the pictures below. 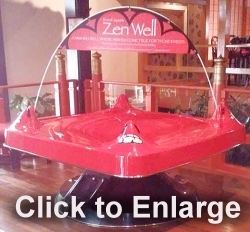 As with all our sizes, you can use the large Well as a "demonstrator" for the small toy model. You can either sell the Vortx's in your gift shop, or give them away FREE with a $25 or greater donation. Based on our tests, more than 3 times as many people will take them FREE for a donation as will purchase them. And as a donation, they never ask for change back! It all depends on your setting and what will work best. Click here to read more about the "FREE for a suggested donation" idea, and for wholesale toy pricing. ASSISTANCE GRANTS FOR NON-PROFIT USE: ProjectKindness.org has announced that it is providing assistance grants for non-profit use while their fund lasts. 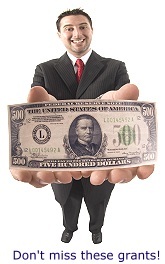 They don't pay all of the cost, but cover a significant portion of it to make it easier for you to afford the balance. If you are raising money for charitable projects, please send us an email or call us at 1-937-384-0003 (Eastern United States) and tell us about your proposed usage. We will let you know if Assistance Grants are available. Seven Footer Order Procedures: Because of the several options with Seven-Footers, there is no standard order form. When we have answered all your questions and you are ready to order a Seven-Footer and know what options you want to include, we will prepare a quote for you. While the Two and Three-Footers include everything you need to put them into immediate service, Seven-Footers are sometimes used differently. So we have listed some optios and recommendations. 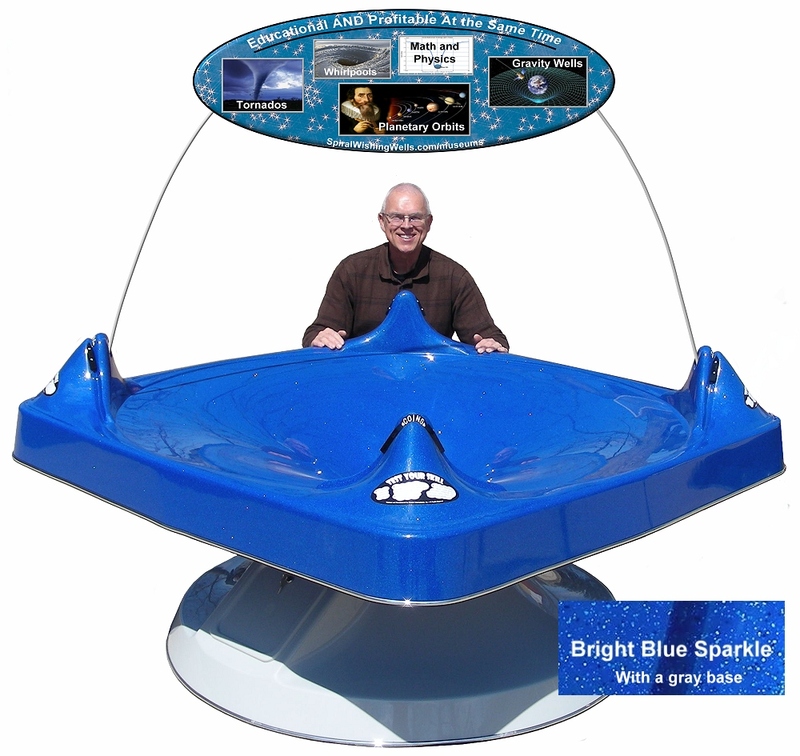 The basic Seven Footer includes the funnel with its 8 built-in molded fiberglass coin launch ramps, an enclosed and secure base welded to the funnel, and a door with a lock and 2 keys. 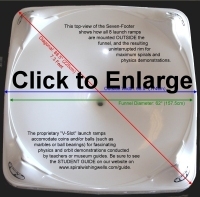 The standard base and funnel is white. Colors are available for $200 (or $300 for the Bright Sparkle Blue). You can "mix and match" at no additional charge . In other words, the funnel can be a different color than the base if you wish, as you have seen in the pictures on this page. 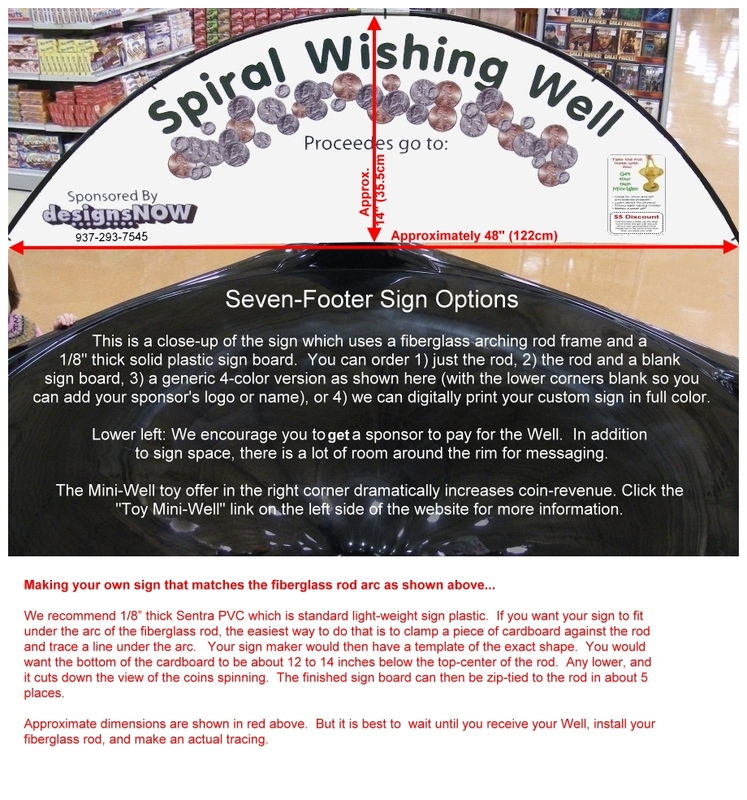 Seven-Footers do not include a sign frame and other options unless you request them because not all locations need the same things. If you can place your Seven-Footer where you can hang a sign from the ceiling, that can be a better option because it is out of reach, and you are not limited to size and shape. If not, you might want our fiberglass rod-and-sign-kit. You can create your own sign or take advantage of our options that include a fiberglass arc rod and a blank, generic, or custom digitally-printed plastic sign that is "zip-tied" to the rod. You can use our generic or custom printed sign, or you can make your own. 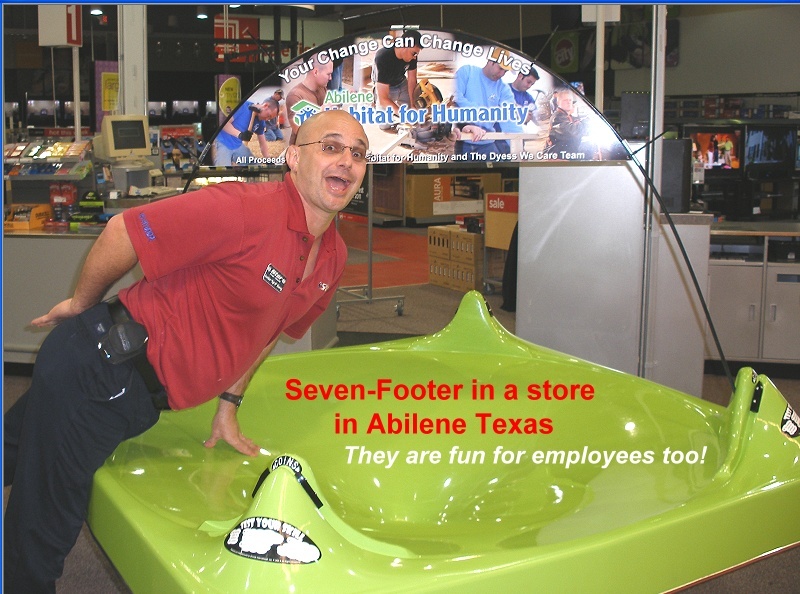 The majority of our 7-Footer customers order the fiberglass rod from us, then make their own sign locally. This can save some back-and-forth communication since it is easier to work with a local small sign maker regarding graphic options and layouts. All modern small sign makers use digital 4-color printing on vinyl, and laminate that to plastic, so it is very easy to make them locally. The most common sign board material is light-density Sentra PVC or similar plastic which most sign makers have on hand. The sign boards are easily zip-tied to the fiberglass rod. You are not limited to the shape that matches the arc of the rod. You can make the sign larger than the fiberglass rod and it can be in any shape to match your needs. For example, it could be in the shape of an animal, a car, a train, or a crown. 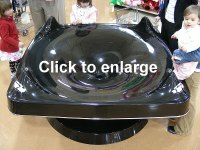 If it extends up beyond the rod, you would want to make two signs to "sandwich" the rod and face each way such as the 20 inch by 60 inch oval shown here (51 cm x 152 cm). Is a sign required? No, not at all. If you don't use a sign above the Well, you can apply decals on the rim which is 5 inches tall (12.7cm) or hang a sign from the rim or build a custom base with signage space as shown in the picture to the right. 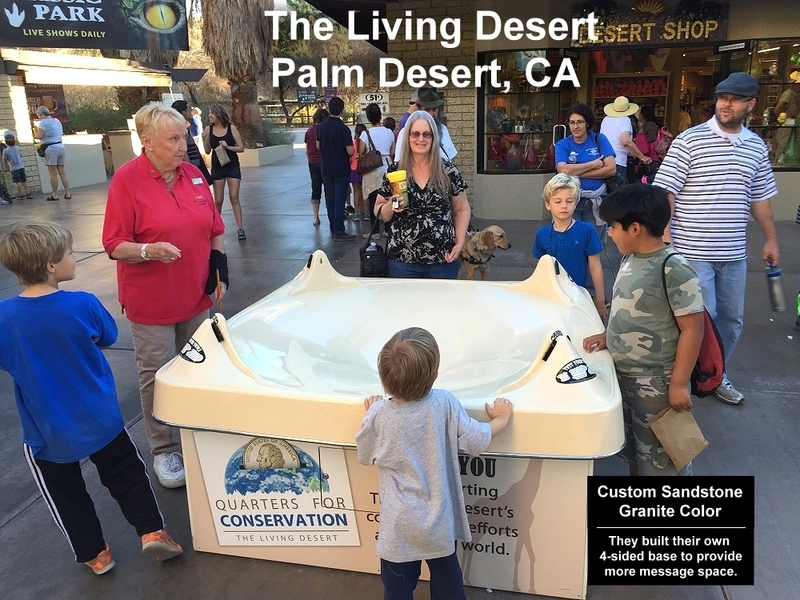 While many children and parents will see the little "COINS" stickers on top of the launch ramps, a sign serves the purpose of inviting them to toss coins in, have fun, and to display the project or recipient of the revenue. So we recommend some form of signage. We provide the pieces necessary for attaching a sign to your Well with a fiberglass rod. 3/8" x 106 5/8 " (0.952 5cm x 270.8cm) Fiberglass arc rod. This is a 2-piece rod, connected in the middle with an aluminum coupling. If you order a rod, we will drill the mounting holes in the ramps and weld a receiving block on the inside. If you only order the rod, we will assume you are going to make your own signage to affix to it. The rod will be included in the package, ready for you to insert into the mounting holes. If you do not order a rod, we will not drill the mounting holes into the ramps unless you specifically request it. Custom 4-color digital laminated printing of whatever you want on both sides such as the Atlanta Airport sign, or the Habitat for Humanity sign on the Well pictured above. 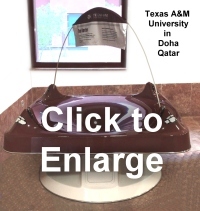 Click here for the approximate dimensions. Layout and Set up: If you supply the "basic" layout of what you want, we will make simple sizing and arcing layouts at no additional charge. Otherwise, the minimum set-up charge of $55 would apply and would probably cover the entire custom layout cost. Again, we recommend you have your sign made locally to avoid the back and forth to us, and then us to our local sign maker and back to you. 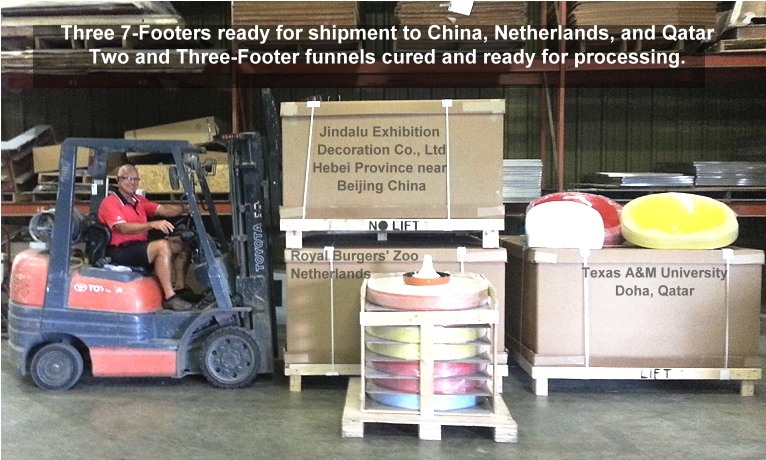 Seven-Footers are custom-crated (fully enclosed and padded) and strapped to a pallet. The total dimensions including the pallet are 72"x72"x46" high (182.8cm x 182.8cm x 116cm). The total weight is 240 pounds (109 kgs). It ships as Class 250 freight. It ships as Class 250 freight. When one Seven-Footer is ordered, the packaging is a "DO NOT STACK" format. We can include 1 Three-Footer and up to 50 toys inside the Seven-Footer at no additional shipping cost. It is possible to unstrap the padded crating from the pallet and hand-lift the Well off the truck. Two average-strength men can lift it, but four are better. It is not terribly heavy…just bulky. It is usually delivered in a full size truck, so a commercially-zoned address is essential. If it has a loading dock, all the better. In fact, please let us know if it includes a dock. Crating is included in the shipping. 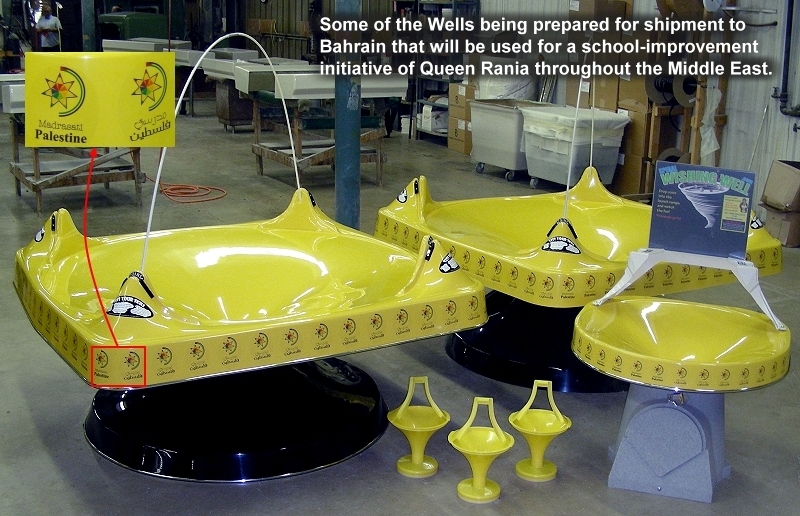 Or, you may pick up the Well at our fiberglass factory in Lebanon Ohio. This would require a pickup, trailer, or other similar vehicle. Shipping varies depending on the location, ranging from $150 to $825 to USA and Canadian destinations. International air freight is usually between $1,400 to $2,500 for most countries, and less if you order multiple quantities. If you are outside the USA, please click here for more shipping information. 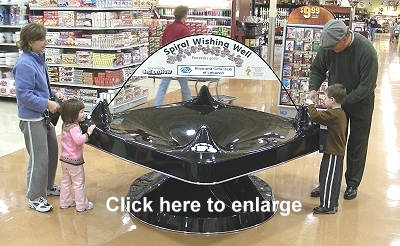 Multiple Wells: Many customers who get a Seven-Footer also get Two or Three-Footers and some toys. 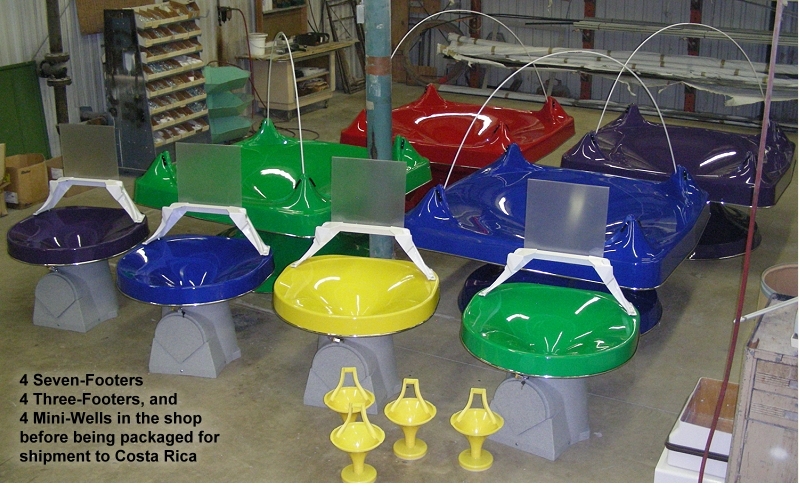 We can fit some of these into the open spaces inside the crating of the Seven-Footers AT NO ADDITIONAL SHIPPING COST. This is because the dimensional-weight of the Seven-Footer is enough greater than its actual weight that adding more weight doesn't change the shipping cost. 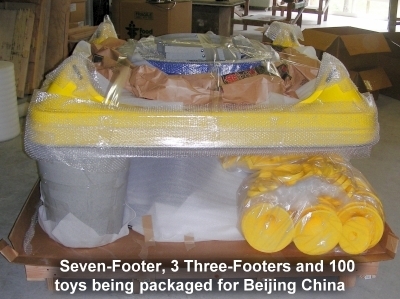 For instance, this picture shows a Seven-Footer, 3 Three-Footers, and 100 Mini-Well Toys bound for Beijing China before the crate is closed. Other combinations of sizes and quantities are also possible. We will gladly combine packaging to help you save shipping cost. If your Seven-Footer will ONLY be used for physics demonstrations with balls (ball bearings, marbles, bb's, etc. ), you can order it WITHOUT the plastic coin-guides on the top of the ramps shown here. 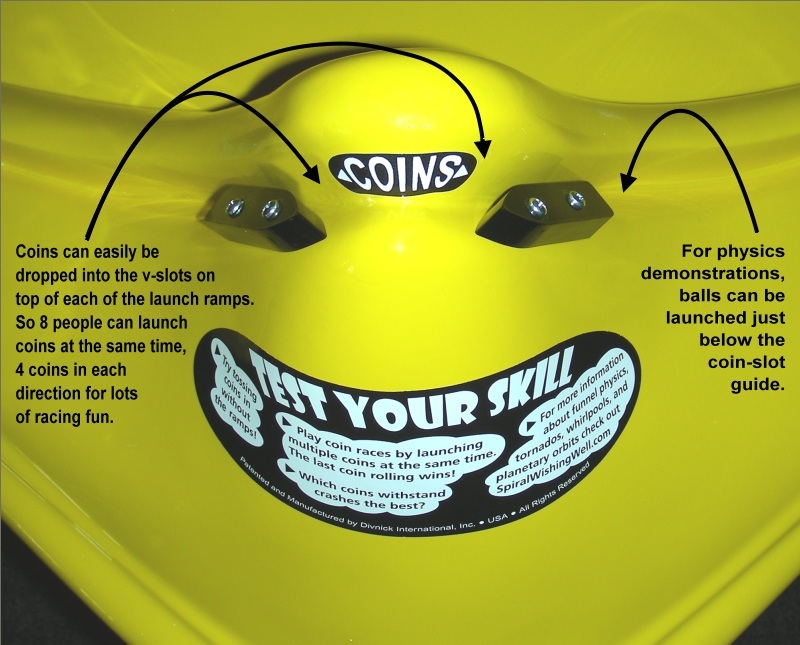 Otherwise, we will include the coin-guides, and you can still use it for demonstrations with balls since they don't need to be launched from the top of the ramps. When we have answered all your questions and you are ready to order a Seven-Footer and know what options you want to include, contact us and we will prepare a quote for you.